The UN Educational, Scientific and Cultural Organisation (UNESCO) proclaimed 8th September as International Literacy Day in 1965, bringing together governments, multi- and bilateral organizations, NGOs, the private sectors, communities, teachers, learners and experts. 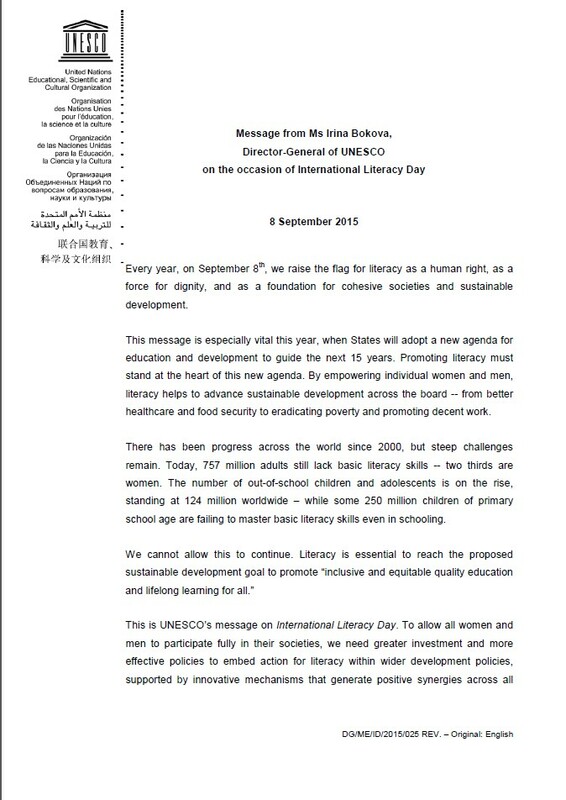 International Literacy Day (ILD) 2015 is celebrated worldwide to highlight literacy “as a human right, as a force for dignity, and as a foundation for cohesive societies and sustainable development” as the UNESCO Director-General, Irina Bokova, explains in her message for the Day. In awareness of the extraordinary importance of education, the Sovereign Order of Saint John of Jerusalem, Knights of Malta, Federation of the Autonomous Priories (KMFAP) has been regularly supporting the education and training of orphans and semi-orphans for many years in Hungary as well as in other countries. With this we would like to contribute to increase the chances of disadvantaged children in life, and to become successful adults. The basic condition of this is to learn to read and write well, as early as possible, and to find joy in reading and gaining knowledge, which promotes the acquisition of literacy and good professional qualifications. In addition, being natural for them the need for lifelong learning, which can not be imagined without writing, reading and perfect text-interpretation. The theme of International Literacy Day 2015 is Literacy and Sustainable Societies. Literacy is a key driver for sustainable development. Literacy skills are the prerequisite for the learning of a broader set of knowledge, skills, attitudes and values, required for creating sustainable societies. At the same time, progress in areas of sustainable development, such as health and agriculture, serves as an enabling factor in the promotion of literacy and literate environments. This year’s celebration of International Literacy Day, therefore, will be dedicated to exploring critical links and synergy between literacy and the future Sustainable Development Goals, which will be adopted during the 70th session of the United Nations General Assembly in September 2015. 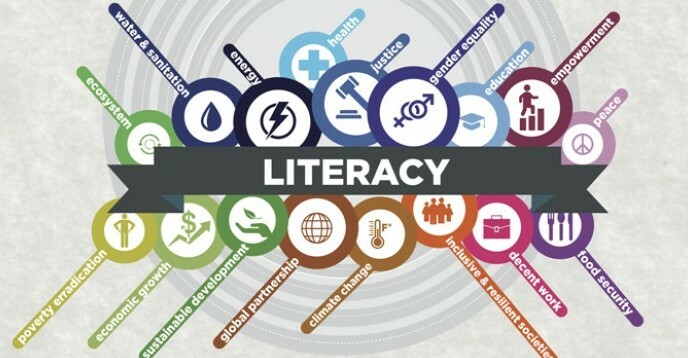 A main global celebration will take place at UNESCO’s Headquarters in Paris, where a two-day event on Literacy and Sustainable Societies (8-9 September 2015) will be organized to prepare the ground for renewed literacy efforts by countries and partners in the post-2015 era. On the 8th September 2015 a ceremony will be held to award the 2015 UNESCO International Literacy Prizes. The Global Meeting brings together nearly 100 United Nations and government representatives, donors, national and international non-governmental organizations, representatives of the private sector and experts from 34 countries to promote youth and adult literacy as a key component of the post-2015 development agenda. 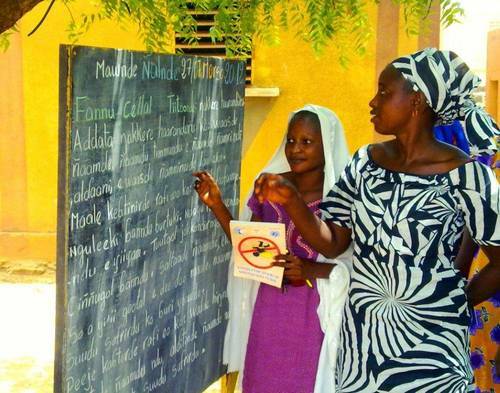 Despite progress worldwide since 2000 when the Education for All (EFA) and the Millennium Development Goals (MDGs) were adopted, some challenges are yet to be overcome. In 2000, the international community pledged to reduce illiteracy rates by 50 per cent by 2015 but, according to the UNESCO Institute for Statistics (UIS), most countries have missed that deadline. According to the UIS, 757 million adults worldwide, two thirds of them women, still lack basic literacy skills. The number of out-of-school children and adolescents is on the rise, standing at 124 million, and approximately 250 million children of primary school age are failing to master basic literacy skills even while at school. Challenges also exist in high-income countries. According to the European Literacy Policy Network one in five adults in Europe lacks the basic literacy skills to understand the instructions on a medicine bottle. Participants at the Global Meeting are bringing their contribution to the 2030 vision of literacy, exploring ways to reinforce the interrelations between sustainable development and literacy in light of the Sustainable Development Goals, which will be adopted by the international community at the UN General Assembly Summit later this month.